It’s a well known story. After feeding the five thousand Jesus spends some time alone. The disciples take a boat back across the lake. At some point Jesus gets up and heads towards the disciples, walking on water across the lake. At first they think they see a ghost, but assured by Jesus’ voice. Peter, ever bold and brave Peter, leaps out of the boat and begins to walk on water. However, a large wave and strong winds cause him to falter and he begins to sink. Jesus grabs him and asks why did you doubt? Then once all are on the boat the disciples worship Jesus, proclaiming that he is truly the Son of God! A well known story, but what is really happening? Is this a miracle story, focusing on Jesus’ ability to walk on water? Is this a miracle story, focusing on Peter’s ability to walk on water? Is this a story about Peter’s faith, or lack of it? Is this a story about doubt? Or is this a story about something else? 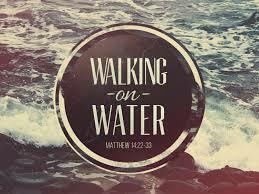 Join us on Sunday as we take a look at a well known passage from scripture and delve into the issues of walking on water. What is the ‘greatest’ miracle that occurs in this story? Where is the climax of this story located? Why? Gracious God, you stretch forth your hand and offer us aid. You are an ever present source of comfort and we give you our thanks and praise. Be with us during all of life’s difficult times. In Jesus name. Amen.